We often meet people who are upbeat and fun, but we may not know anything about their past and the tough roads they may have traveled. Courtney is one such individual and her attitude belies her history and personal transformation. From the ages of 14 to 17 I lived on the street, a product of children’s aid. Badly addicted to hard drugs, I didn't have a very bright future ahead of me; anyone could see that. Back then I didn’t even have a garbage bag worth of belongings … then I got pregnant. My son became my inspiration, the catalyst I needed to change. I went to AA and stayed with my parents as I went through rehab a few times before I gained better control. Gathering my courage I went back to school and became a law clerk. 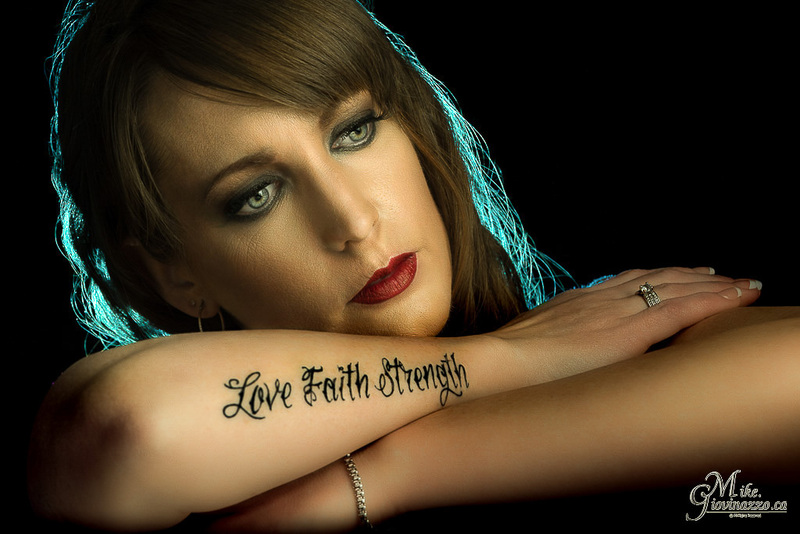 The Courage, Strength and Hope tattoo represents what it took for me to get clean, and stay clean. It was time to build a home, a life and a future for my baby. I added the butterfly after a year of “clean”. It is a symbol of my transformation, my metamorphosis. Butterflies start out as ugly caterpillars and end up changing in to thing of beauty. Back then I felt I was like butterfly – transformed and ready to fly … now I am older and realize I have still not really full evolved. I want to keep growing, always pursuing self‑help books and seminars. Personal growth is not always easy, but it is always possible. Some tattoos are about transformation, personal milestones, or memorials. This one is about inspiration and deeply held beliefs. Chris literally wears his heart on his sleeve and his heart belongs to god. A devoutly religious man, Chris had a sleeve designed to signify his deeply held convictions. His entire sleeve is a reminder God’s love and our struggles though life. At the top is a dove with olive that symbolizes peace. The dove is important because the devil and temptation comes in many forms. The devil is tricky and can impersonate any animal, except a dove; so the dove and his religious helps keep Chris safe. The stone cross and rose ties were designed by Chris. They convey the love of Jesus and the dove is landing on cross, a reminder to avoid temptation. Then tip of Mount Everest is the backdrop for cross and dove. The journey through life is like climbing a mountain. There are many obstacles to overcome as you climb but when you reach top, you are with god. Other details are a link to his dad who was into Tia Chi and martial arts. Chris, born in year of the tiger relates to the personality and published significance of the tiger. Finally he has a reference to Psalm 27 (The Lord is my light …). This vital passage was of special significance to Chris during time of family turmoil. It says you need the strength to meet challenges. The tattoo also includes elements that symbolize love and has clouds to complete the mountain and dove. 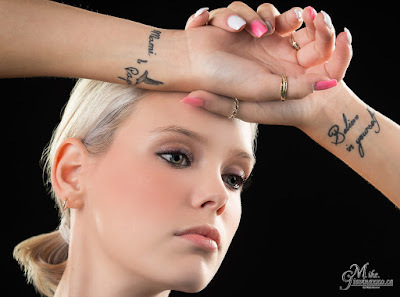 Together they deliver a powerful message of love and dedication, as well as a constant reminder of life’s challenges. AmansCatti loosely translated from Latin means Cat Lover. She admits not everyone understands or even believes in witchcraft. In her experience however, even if we don’t fully understand something, we can benefit from it. 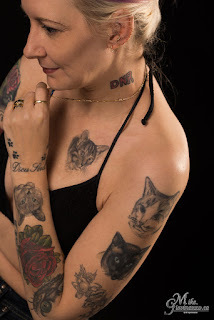 Her numerous cat-based tattoos are a tribute to her first pet, who acted as a “familiar”. I had my first cat at 6 years old and he was with me for 18 years. 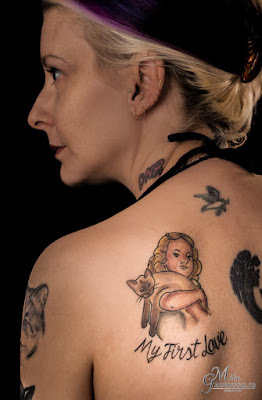 I have a portrait of this lovely Siamese on my arm as a memory of his eternal bond, and a "My First Love" dedication on my back. He was much more than a pet. We really shared a spiritual bond. My family moved around a lot and my cat was the one constant in my life. As an only child, my cat was like the brother I never had. Playing dress up, I recall having a wedding gown and wanting to marry my cat. He was always with me… as I did mundane tasks like homework or as I suffered through various illnesses and chronic bronchitis. When I got older he’d help guide my decisions. For instance he’d judge my boyfriends and I could tell by his reaction whom I could trust. For others to appreciate this special bond is perhaps challenging. In Wiken terminology there is the term “A Familiar”. It has been described as an animal spirit believed to serve a witch or magician, as a domestic servant, spy and companion ... in addition to helping to bewitch enemies or to divine information. I can relate to this, not from a magical sense but from the perspective of a very special and intelligent companion. There have been others since, but he was very special. After almost 20 years, I can still feel him walk on me when I’m drifting off to sleep. It might all sound like too much, but for me this is real. Who else has a shrine dedicated to a cat in their home?